Pyx with Enamel Chalice Motif. Pyx with Enamel Wheat Motif. Pyx with Enamel Fish Motif. Pyx - Celtic Cross Design. 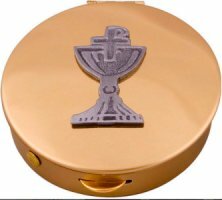 Teaching Christ Pyx with Art Metal Lid. 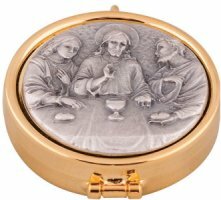 Last Supper Pyx with Art Metal Lid. Chalice Pyx with Art Metal Lid.